This cake has no refined sugar - the sweetness comes from dates and apples, which also make it deliciously moist. The dates contain a relatively high level of natural sugar but, because it is bound up in the fibre of the fruit, it will take far longer to be released into the system than the refined sugar one would normally use in cakes. 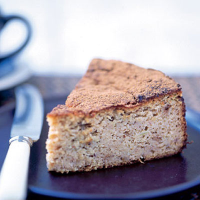 Gluten- and wheat-free, the cake can also be dairy-, soya- and nut-free. It uses ground almonds for texture and moistness but, if you cannot eat nuts, the cake works equally well if you replace the almonds with the same weight of flour. Preheat the oven to 180°C, gas mark 4. Grease a 20cm round cake tin with removeable base. In a processor, blend the butter or spread with the dates and apples. Transfer to a bowl. Mix the flour, almonds, cream of tartar and bicarbonate of soda. Mix 1/3 of the egg into the apple mixture, then add 1/3 of the flour mixture. Repeat twice, so all the ingredients are combined. Spoon into the tin. Bake for 45 minutes or until a skewer inserted in the cake comes out clean. Cool slightly in the tin, then turn out and cool completely on a rack before slicing.